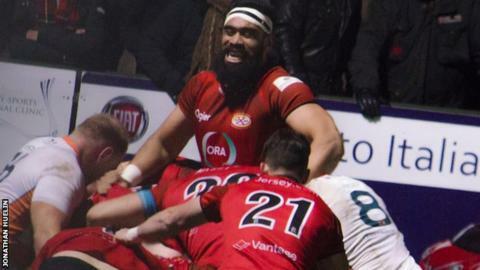 Jersey boosted their hopes of making the knock-out stages of the British and Irish Cup with a 40-10 win at Connacht. Tonga international forward Uili Kolo'ofa'i celebrated a hat-trick in the opening half hour to put the visitors in control. Scrum-half Jack Moates got the fourth try, from a maul, to seal the bonus point before half-time. Kolo'ofa'i got his fourth before late tries from Connacht replacement Steve Kearns and Jersey centre Oli Evans. Connacht remain bottom of Pool Five, still searching for their first point. In Saturday's other match in the group, Doncaster Knights moved top of the table with a 21-16 win over Newport Gwent Dragons 'Select'. Jersey: Lane; McCrea, Evans, Cooke, Dawson; Penberthy, Moates; Lancuba, Selway, Herriott, Markham, Phillips (capt), Freeman, Spinks, Kolo'ofa'i. Replacements: McCarthy, Anderson, Featherstone, Rowlands, Dudley, Owen, Burroughs.